Welcome to PrintPapa!! 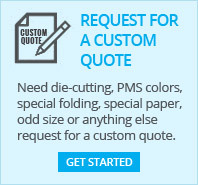 One of the premier online custom Printing Services in Bay Area, California. Our goal is to provide affordable one-stop high-quality printing service hassle free. We have a big range of products from Business cards, Brochures, Flyers, Postcards, Notepads, Catalogs, T-Shirts, Signs, Banners and more. We offer 100% Satisfaction Guarantee on all jobs. So there is nothing to worry about. To get started click on ALL PRODUCTS (blue button on top menu) or choose any product from the left catalog. Cube Box 2.75" & 4"
Triangle Shaped Business Card - 3"x3"
Ink Drop Shaped Business Card - 3.5"x2"
Flower Shaped Business Card - 3"x3"
Oval Shape Flyer - 10" x 7.5"
Octagon Shape Flyer - 6.5" x 6.5"
Daisy Shape Flyer - 8.25"x7.5"
Port & Company Essential Performance Tee. PC380. Oval Shaped Business Card - 3.5"x2"